Good morning from the GSG booth on Day 2 of ISPA Expo. Yesterday, this new Porter International PALS 2000 automated label machine saw a lot of attention. It has similar sewing technology used in more familiar PALS 3000 mattress panel auto-labeler. The PALS 2000 is designed for the growing popularity of applying mattress labels to the borders. 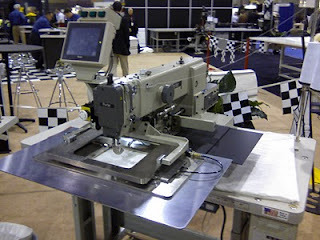 The high speed automation allows the operator to multi-task on other work while the PALS 2000 sews on the label. I'll share more info on new GSG mattress machines throughout the show.